This one is for the speed-fiends! 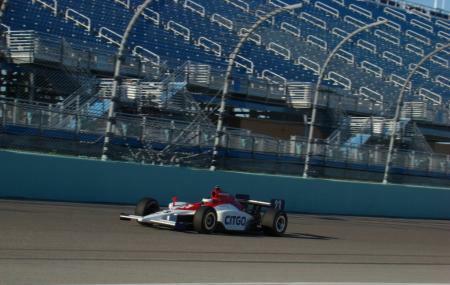 Located just outside of Miami in homestead this motor racing track holds several events including NASCAR, IndyCar Series and many more. Apart from visiting here to watch a race, one can actually participate in one! Fast Lane Fridays are held here at Homestead Miami Speedway and they allow you to bring your car and race against friends and others on the NASCAR track. Spectators too are welcome and can watch from the stands. This is a fun outing for the whole family and all are welcome to participate. There is a gift shop where you can purchase souvenirs. You must be at least 18 years old to race. All vehicles must be street-legal and drivers must have a valid driver’s license. All ticketed track seating areas at Homestead-Miami Speedway are smoke-free. Drivers must wear sleeved shirts, pants and close-toes shoes. There is a hospitality area within the Speedway for food and beverages. For ticket packages, refer to the website. Fast Lane Friday- 6:00 pm onwards. How popular is Homestead Miami Speedway? People normally club together Dolphins Plus Bayside and Biscayne National Park while planning their visit to Homestead Miami Speedway. Adrenaline rush!!! Amazing experience, only the fire suits needs more attention. They are very dirty and sweaty, besides that I would totally recommend it. Take water and some comfy outdoor outfit. When riding the car is very very hot. Awesome view wherever you sit. Pitt road close to front stretch without grass in between. Great to hear the air guns not just see pit stops. Easy egress after race, plenty of FREE parking pre race. Decent concessions. Had a Fantastic time. First time trying it out for my girlfriends birthday and it was amazing. They prep you and have all the safety equipment. Also the prices are very reasonable and affordable. If you like competitive fun it's a must stop in Homestead. Spending the afternoon-evening at the 2019 Homestead Balloon Glow. Having fun and taking some shots. You can enjoy the food trucks.